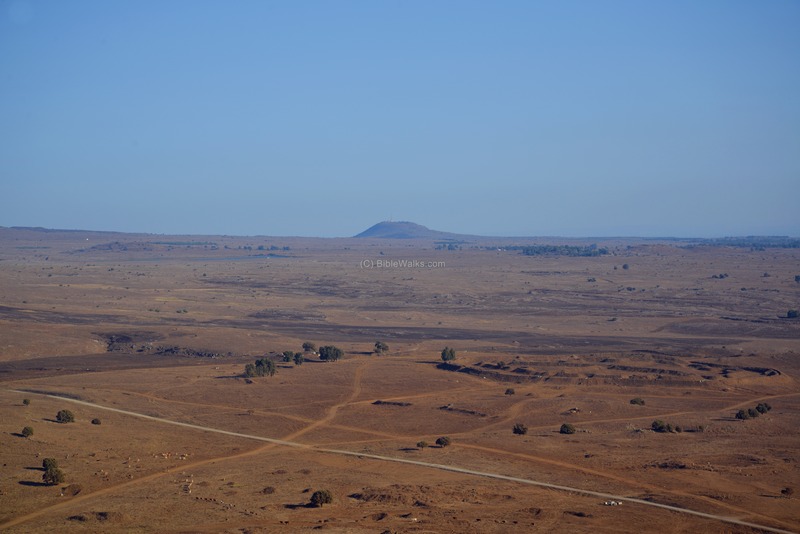 Mount Shipon (Tell Abu Al-Hanzir) is an extinguished volcano, located in the south-west section of the northern Golan heights region. The area around the site witnessed heavy battles during the 1973 war between Syrian forces and Israeli Army. An observation site and monument is located on the summit to view the battlefield. 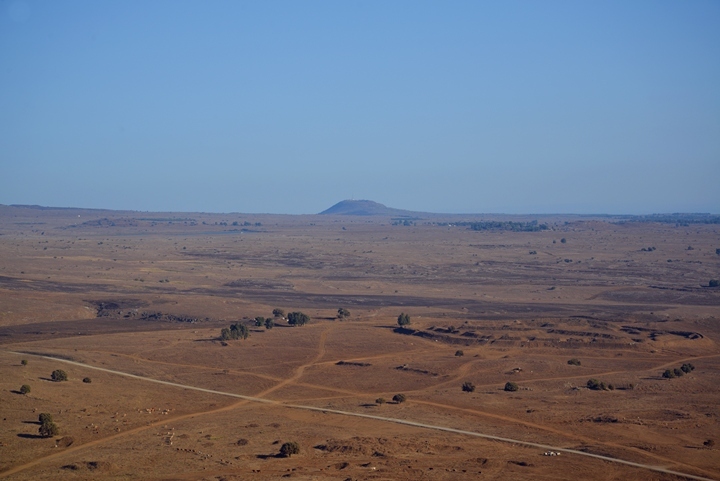 Mount Shipon is located to the south of Kibbutz Ortal in the northern Golan area. A dirt road leads from Highway #91 to the top of the mountain (971m above sea level). Part of the hill, and the area south of it, is a closed military zone used for military training exercises. Some of these areas may be open to the public only during the weekends. The central Golan is a geological downward fold (syncline) between Mt Hermon in the north and the Gilad Mountains in the south. Under this fold of layers the Magma (molten rock) pushed up through cracks and holes. This eruption of Magma flooded the sunken area with basalt rock after cooling off above the ground. The Bible has a description of an earthquake that describes this eruption (Micah 1 4): "And the mountains shall be molten under him, and the valleys shall be cleft, as wax before the fire, and as the waters that are poured down a steep place". This process occurred in 3 phases: 4 million, 2 million, and 1 million years ago. 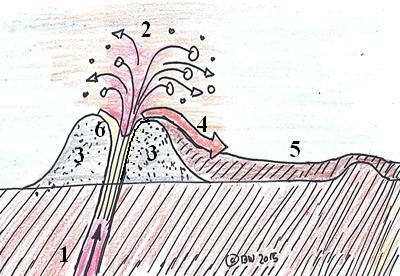 The forth eruption, 100,000 years ago, created the volcanic hills - Shipon, Yosifon and Peres. These volcanoes are now extinct. The type and size of the volcanoes depend on the the nature and the size of the fragments which are ejected during the eruption. Mount Shipon is a typical "ash cone" volcano, where the eruptions was mainly of gas. 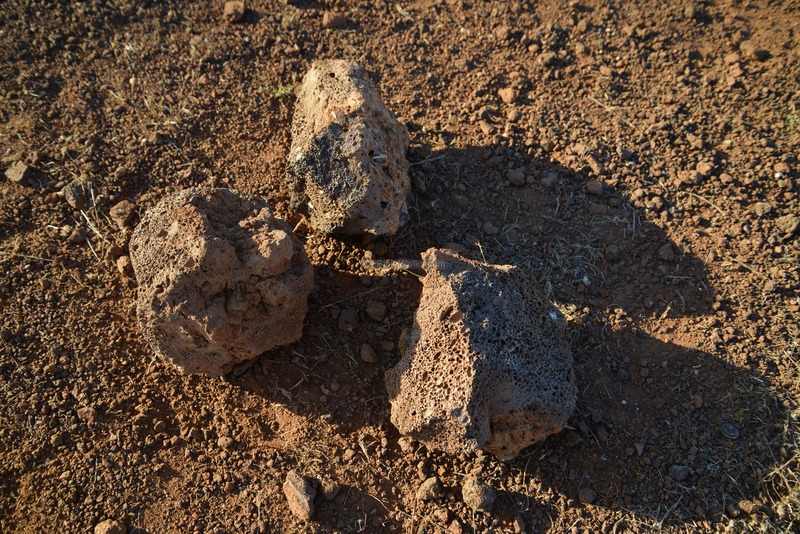 The erupted fragments were Scoria (light rock with many bubble holes), and Tuff (consolidated volcanic ash), which piled up around the vent. The extinct volcanoes reviewed in this website (Shipon, Yosifon, Peres, Avital and Bental) have some variations in the process, creating different forms of their hills. On Oct 6, 1973, the Egyptian and Syrian forces attacked Israel from two fronts. On the Golan, the Syrians stroke with a heavy artillery and air bombardment, then penetrated into the Golan with hundreds of tanks and thousands of soldiers along several lines. At the end of the first day, the Syrians captured the Nafah base, 2km west of Mount Shipon, and also held the whole area south of it. The few tanks of the Barak armored brigade 188 heroically slowed down the Syrian drive. On the second day they were supported by newly arrived tanks of the 679 reserve armored brigade, headed by Ori Orr, and managed to block the Syrian advances. On the third day the Syrians attempted again to capture Nafah by an airborne commando attack, but failed. The 679 reserve armored brigade counter-attacked in the area south of Shipon, recapturing some of the area controlled by the Syrians. On the forth and fifth day the brigades 679 and 179, assisted by the air force, drove the Syrians out of the Israeli-held Golan. The Syrians left behind hundreds of burnt tanks in the area south of Mt Shipon. During these bloody battles, the 679/434 brigade lost 74 soldiers. A memorial to the brave soldiers is located on the western foothills of Mt Shipon. Shipon is a nature reserve area, and open to the public. 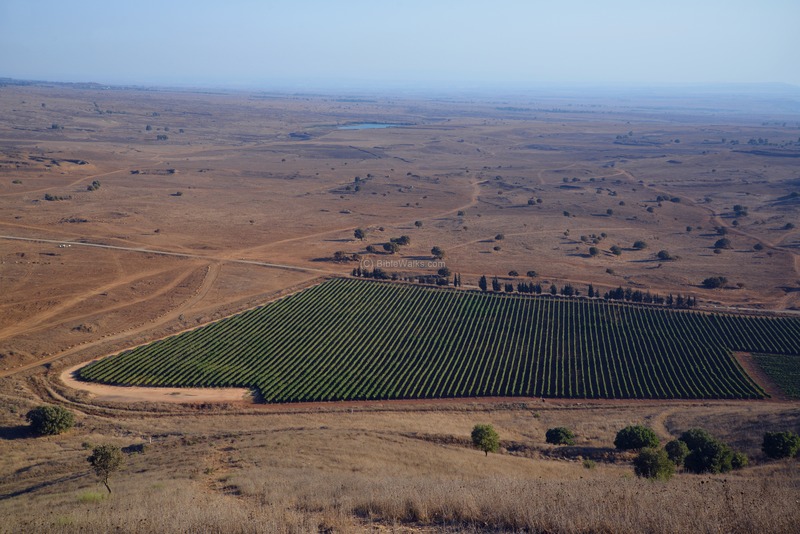 It is a recommended place to view the area and the volcanic hills of the Golan. Mount Shipon, with its two peaks, is seen here from the north. A dirt road leads from road #91 to the eastern peak. The hill towers 90m (300 ft) over the surrounding north area, lower than the height differences on its south side. The difference between the north and south sides is due to inclining angle of the vent, causing the lava to flow out from the crater towards the north side, raising the height of the area by ~50m (160 ft) with an extra basalt layer. The view below of the north side of Shipon is from Mt. Bental, another volcanic hill. Mount Shipon is located near the young Kibbutz Ortal (established 1977). The vineyards of Kibbutz Ortal produce fine grapes for the Yarden winery. 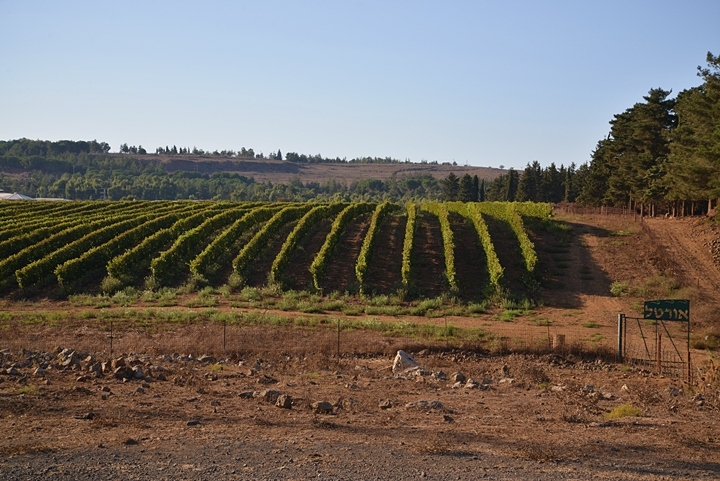 The basalt soil and the Golan temperature are a major factor of the success of the Golan wines. This photo shows the sites on the north of Mt Shipon. In the far background is Mt Hermon (2208m, 7244ft) - the highest point in Israel. Two extinct volcanoes are seen here - the close one is Mt Avital at an altitude of 1079m (3540 ft), and the far one is Mt Bental at 1049m (3441 ft). Mt. Avital, the highest and widest of the volcano hills in this region, was created by a massive explosion of the tip of the hill. The explosion reduced its height to half, but threw the Scoria and Tuff fragments of its cap to all sides, causing it to build up a higher area around it. Mt. 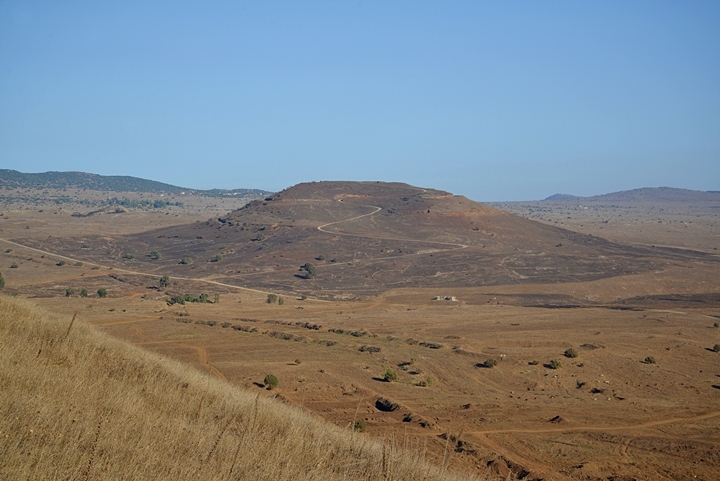 Bental is another case of inclined vent, where the lava flowed to the west side, carrying with it large sections of the Scoria hill, creating small hills on the west side. The area south to the site is mostly barren. The green patch in this photo is the only exception. Mt Shipon towers over the surroundings on an average of 100-150m (320-500 ft) above this side. The area is a large military zone. The strategic importance was proven during the 1973 war, by adding a buffer zone between the Israel and the Syrians, as the border is 8km (5 miles) to the east. 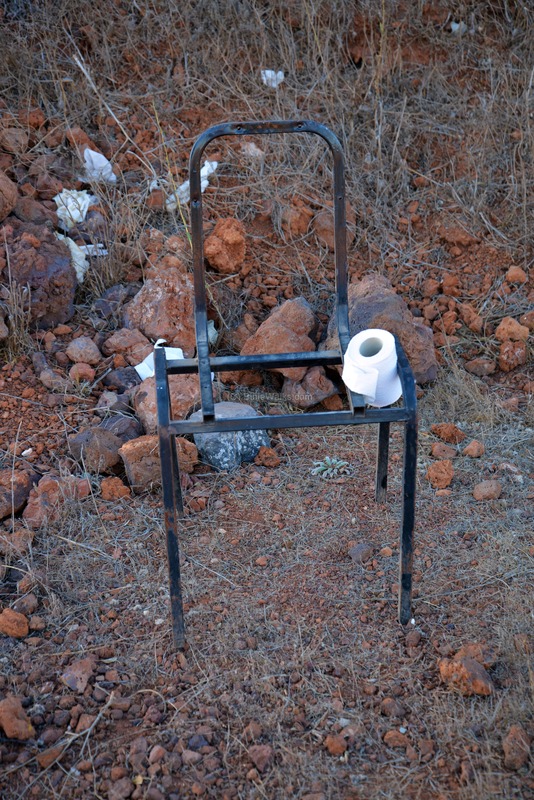 Three km (1.8 miles) southeast of Mt. Shipon is Mt. Yosifon, another extinguished volcano. Mt. Yosifon is slightly higher - 981 m (3,219 ft) above sea level. Its Arabic name is Tell Yusuf (means: Mt. Joseph), which could be translated to Hebrew as the Tel Yosef. 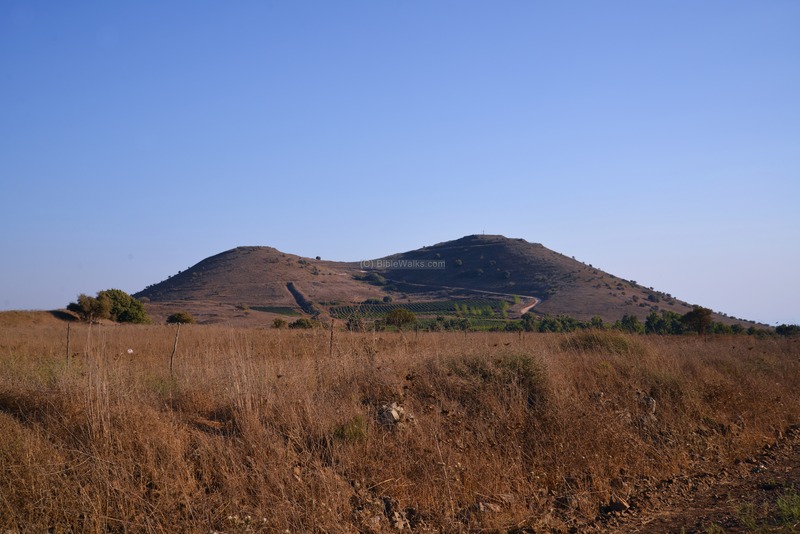 Since this name was already taken (a Kibbutz in Jezreel valley), the hill was named after the Roman period General and Historian Josephus Flavius (Yosef Ben Matityahu). Josefus wrote the book of Yosifon (Jossipon) - a chronicle of Jewish History. Yosifon was created slightly different from Shipon - during the eruption the lava cooled up earlier, sealing the vent, thus stopping the flow outwards. This created a round hill, unlike Shipon where a basalt layer added height on the north side. Farther south east (15km, 9.3 miles) is Mt. 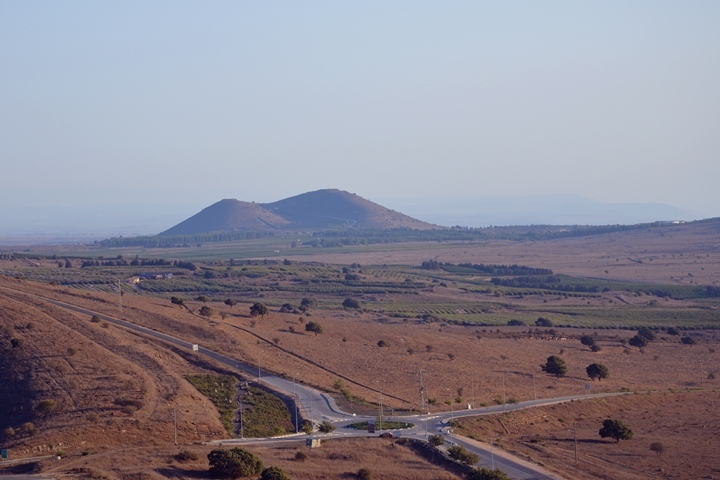 Peres (Tell el-Faras), another extinct volcano, seen in the center of the photo below. Peres is 886m (3,048ft) above sea level, and has a complete crater. Mt. Peres was created with an upright vent, causing the scoria to build up symmetrically around the hole. After the cooling of the lava in the center, the height of the central area lowers in relation to the sides, thus creating a sealed crater in the center, unlike Mt. 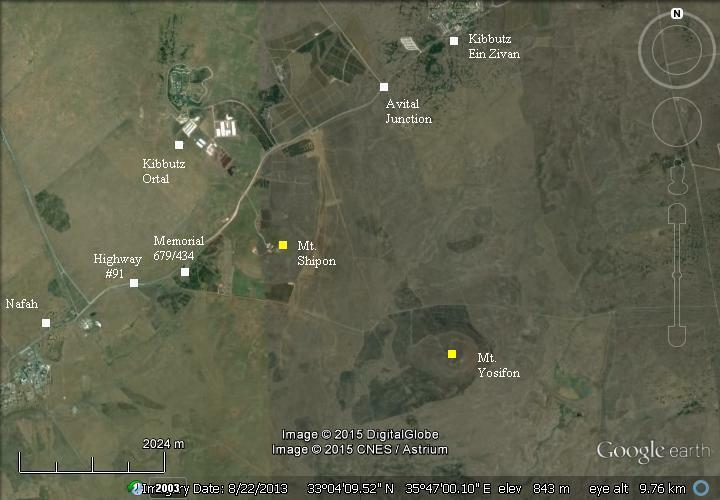 Shipon and other ash-cone volcanoes in the Golan. 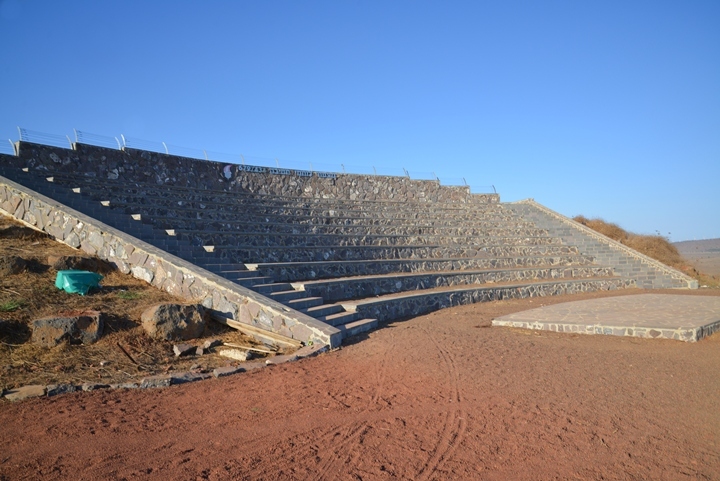 A small amphitheater, built of local basalt stones, was erected on the eastern section of the hill. It overlooks the battlefields of brigade 679 during the 1973 war. We arrived to the site of the battles exactly 40 years later. Looking southwards, the flat barren area looks peaceful, not reflecting the bloody battles that occurred during this terrible war. 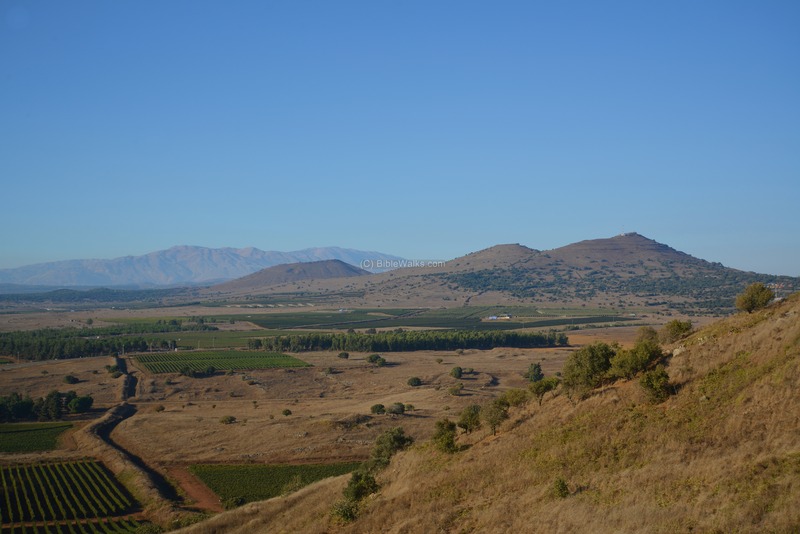 On the foothills the volcanic hill is a quarry of Scoria (light rock with many bubble holes) and Tuff (consolidated volcanic ash) and basalt rocks. On top of the hill are fragments of Felsic lava rocks (rich in Silica and quartz), seen here as light rocks with many bubble holes. A Panoramic view, as seen from the observation point on Mount Shipon and looking south, is shown in the following picture. If you press on it, a panoramic viewer will pop up. Using this flash-based panoramic viewer, you can move around and zoom in and out, and view the site in the amazing full screen mode (like you are really there). Hotspots are indicated on the view, indicating the major points of interest. Shipon, Shifon - Hebrew for Mountain Rye, a type of wild wheat grain, which grows on the hill. Its Latin name is Secale Montanum. Tell Abu AlHanzir - Arabic name of the mountain: The mound of the pig demon. Tell - mound; Abu - father; Alhanzir - a warthog, a wild member of the pig family. The wild pig, which is found in this area in great numbers, symbols an underground demon, such as the volcano. Ortal - nearby Kibbutz, established 1977. Yosifon - Hebrew name of the hill south of Shipon, named after Josephus Flavius (or his book, Yosifon-Josippon).